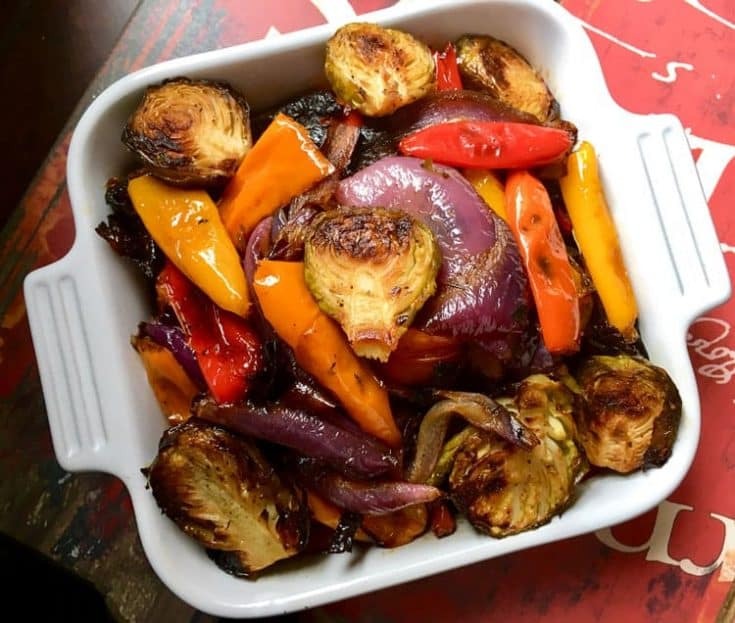 This Mediterranean Roasted Vegetables recipe roasts mini sweet peppers, Portobello mushrooms, red onions, and Brussels sprouts to perfection. Don’t be surprised if this roasted vegetable recipe becomes a new favorite in your household. Roasting intensifies the natural sweetness of vegetables, so you may find yourself reaching for a second serving of Mediterranean Roasted Vegetables instead of your normal after-dinner dessert! If you don’t have Herbs de Provence on hand, you can use Italian seasoning instead. This will alter the flavor a bit, but you’ll still love the results! If you’re wondering what the difference is between Herbs de Provence and Italian seasoning, Herbs de Provence often includes savory and/or lavender, both of which don’t appear in Italian seasoning. This recipe is a great way to use up the leftover vegetables in your fridge. While fresh vegetables will always be the best choice when making roasting vegetables, if you have some veggies on their last leg in your fridge, add them to this dish! You can make vegetable substitutions. If you don’t have one or a few of the veggies listed here, feel free to substitute them with any study vegetable. By that, I mean vegetables like parsnips, carrots, fennel, butternut squash, and eggplant. For best results, cut vegetables in a uniform shape (as much as you can) and thickness. 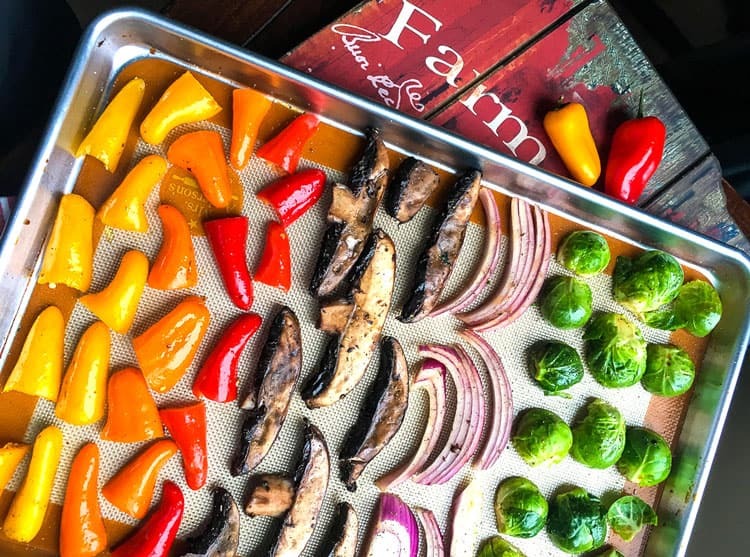 Take a look at the vegetables on the sheet pan in the above photo. Notice how the peppers, mushrooms, and red onions are in about the same shape? And all the vegetables, Brussels sprouts included, are cut to the same thickness? That’s what you want to aim for with this recipe so everything is cooked evenly. Use a silicone baking mat for easy clean-up. We’re huge fans of silicone baking mats in my household because they make clean-up a breeze! 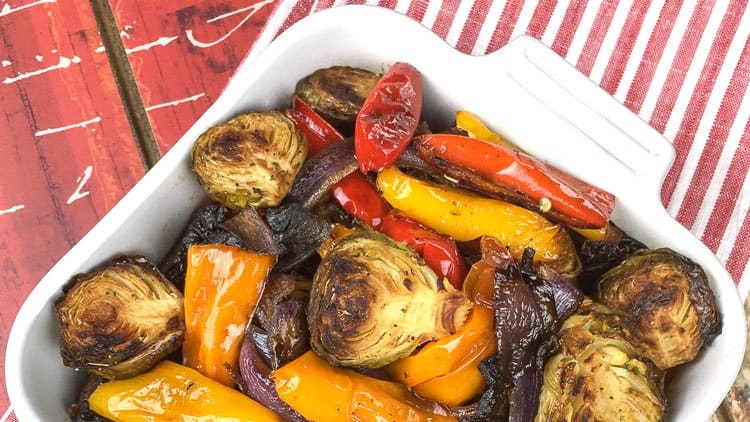 This Mediterranean Roasted Vegetables recipe might just become a new family favorite! Line a large, rimmed baking sheet with a Silpat® baking mat or parchment paper and then set aside. Preheat oven to 425°F. To a large mixing bowl, add Portobello mushrooms, mini peppers, onion, and Brussels sprouts. Add Herbs de Provence, garlic powder, olive oil, and balsamic vinegar. Gently toss to combine. Generously season with salt and black pepper to taste. Place sheet pan in oven. Roast for 40-45 minutes, stirring halfway through. The vegetables should be roasted until they’re tender and have developed a caramelized color. If necessary, you can use Italian seasoning instead of Herbs de Provence. The flavor will be slightly altered, but still delicious.